Feathers are one of the epidermal growths that form the distinctive outer covering, or plumage, on birds. They are the outstanding characteristic that distinguishes the Class Aves from all other living groups. Other Theropoda also had feathers (see Feathered dinosaurs). Extreme closeup of the feathers of a baby Yellow-headed Parrot. Feathers are among the most complex structural organs found in vertebrates: integumentary appendages, formed by controlled proliferation of cells in the epidermis, or outer skin layer, that produce keratin proteins. The β-keratins in feathers, beaks and claws — and the claws, scales and shells of reptiles — are composed of protein strands hydrogen-bonded into β-pleated sheats, which are then further twisted and crosslinked by disulfide bridges into structures even tougher than the α-keratins of mammalian hair, horns and hoof. Feathers insulate birds from water and cold temperatures. Individual feathers in the wings and tail play important roles in controlling flight. These have their own identity and are not just randomly distributed. Some species have a crest of feathers on their heads. Although feathers are light, a bird's plumage weighs two or three times more than its skeleton, since many bones are hollow and contain air sacs. Colour patterns serve as camouflage against predators for birds in their habitats, and by predators looking for a meal. As with fish, the top and bottom colors may be different to provide camouflage during flight. Striking differences in feather patterns and colours are part of the sexual dimorphism of many bird species and are particularly important in selection of mating pairs. The remarkable colors and feather sizes of some species have never been fully explained. 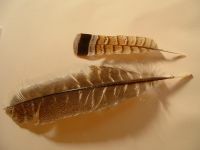 There are two basic types of feather: vaned feathers which cover the exterior of the body, and down feathers which are underneath the vaned feathers. The pennaceous feathers are vaned feathers. Also called contour feathers, pennaceous feathers are distributed over the whole body. Some of them are modified into remiges, the flight feathers of the wing, and rectrices, the flight feathers of the tail. 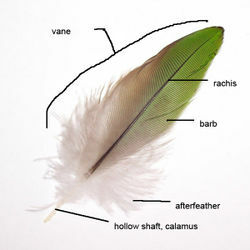 A typical vaned feather features a main shaft, called the rachis. Fused to the rachis are a series of branches, or barbs; the barbs themselves are also branched and form the barbules. These barbules have minute hooks called barbicels for cross-attachment. Down feathers are fluffy because they lack barbicels, so the barbules float free of each other, allowing the down to trap much air and provide excellent thermal insulation. At the base of the feather, the rachis expands to form the hollow tubular calamus, or quill, which inserts into a follicle in the skin. 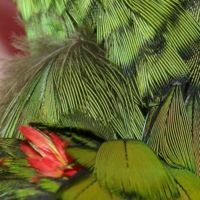 The Dyck texture is what causes the colours blue and green in most parrots. This is due to a texture effect in microscopic portions of the feather itself, rather than pigment, or the Tyndall effect as was previously believed. The spectacular red feathers of certain parrots owe their vibrancy to a rare set of pigments found nowhere else in nature. A bird's feathers are replaced periodically during its life through molting, new feathers are formed through the same follicle from which the old ones were fledged. Some birds have a supply of powder-down feathers which grow continuously, with small particles regularly breaking off from the ends of the barbules. These particles produce a powder that sifts through the feathers on the bird's body and acts as a waterproofing agent and a feather conditioner. Most waterbirds produce a large amount of powder down. Waterproofing can be lost by exposure to emulsifying agents due to human pollution. Feathers can become waterlogged and birds may sink. It is also very difficult to clean and rescue birds whose feathers have been fouled by oil spills. Bristles are stiff, tapering feathers with a large rachis but few barbs. Rictal bristles are bristles found around the eyes and bill. They serve a similar purpose to eyelashes and vibrissae in mammals. Feathers most likely originated as a filamentous insulation structure, or possibly as markers for mating, with flight emerging only as a secondary purpose. It has been thought that feathers evolved from the scales of reptiles, but recent research suggests that while there is a definite relationship between these structures, it remains uncertain the exact process. (see Quarterly Review of Biology 77:3 (September 2002): 261-95). Experiments show that the same protein (when missing before birth) that causes bird feet to stay webbed, causes bird scutes and scales to become feathers. Although birds use feathers primarily for flight, several dinosaurs have been discovered with feathers on their limbs that would not have functioned for flight. One theory is that feathers originally developed on dinosaurs as a means of insulation; those small dinosaurs that then grew longer feathers may have found them helpful in gliding, which would have begun the evolutionary process that resulted in some proto-birds like Archaeopteryx and Microraptor zhaoianus. Other dinosaurs discovered with feathers include Pedopenna daohugouensis, Sinosauropteryx, and Dilong paradoxus. Currently the question is whether birds are deinonychosaurians or dromaeosaurids, not whether birds are dinosaurs. It has been suggested that Pedopenna is older than Archaeopteryx, however, their age remains doubted by some experts. Dilong is a tyrannosauroid which predates Tyrannosaurus rex by 60 to 70 million years. Feathers have a number of utilitarian and cultural and religious uses. 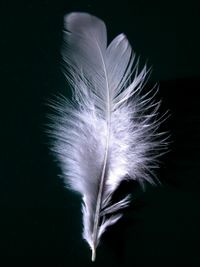 Feathers are both soft and excellent at trapping heat; thus, they are sometimes used in high-class bedding, especially pillows, blankets, and mattresses. They are also used as filling for winter clothing, such as quilted coats and sleeping bags; goose down especially has great loft, the ability to expand from a compressed, stored state to trap large amounts of compartmentalized, insulating air. Bird feathers have long been used for fletching arrows and in the past were used for ink pens. They have also been put to use as sexual aids; see feather-dancing. Another human use is tickling for their soft feeling. Colorful feathers such as those belonging to pheasants have been used in the past to decorate hats and fishing lures. During the late 19th and early 20th Centuries a booming international trade in plumes, to satisfy market demand in North America and Europe for extravagant head-dresses as adornment for fashionable women, caused so much destruction (for example, to egret breeding colonies) that a major campaign against it by conservationists caused the fashion to change and the market to collapse. Eagle feathers have great cultural and spiritual value to American Indians as religious objects. The religious use of eagle and hawk feathers are governed by the eagle feather law (50 CFR 22), a federal law limiting the possession of eagle feathers to certified and enrolled members of federally recognized Native American tribes. Various birds and their plumages serve as cultural icons throughout the world, from the hawk in ancient Egypt to the bald eagle and the turkey in the United States. In Greek mythology, Icarus tried to escape his prison by attaching feathered wings to his shoulders with wax, which melted near the Sun.